Today I want to talk with you about one of the most nutritious foods on the planet, liver. Now if you’ve never eaten liver before, you may have just cringed a little bit. This unusual meal is seldom eaten by Americans these days. That’s too bad, really. Liver is an absolute powerhouse of nutrients, vitamins and minerals. In fact, gram for gram it’s one of the most nutritious foods on the planet. It’s very high in protein. Liver also contains an easily absorbed form of iron, all of the B vitamins, and remarkable amounts of vitamin A. If that weren’t reason enough to consider adding liver to your diet, I have a few more. You can find many more trace elements and minerals in liver. These include copper, zinc, chromium, phosphorous and selenium. You can also find the essential fatty acids EPA, DHA and AA, as well as the powerful antioxidant CoQ10. For anyone looking to optimize their health, liver is a must in your diet. Below, I’ve listed the top three reasons to start eating liver today. Vitamin A is a fat-soluble vitamin that plays a critical role in maintaining healthy vision, neurological function and healthy skin. In nature, vitamin A comes in two forms: active vitamin A and beta-carotene. Active vitamin A comes from animal-derived foods and is called retinol. You can find beta-carotene in fruits and vegetables. But this red-orange pigment needs to first be converted to active vitamin A in order to be utilized by the body. The "pre-formed" retinol can be used directly. This makes it the preferred source for your body. However, retinol is very hard to find in needed quantities. That is, outside of organ meats — specifically liver. For example, a cup of broccoli only has around 2,500 International Units (IU) of inferior beta-carotene. Meanwhile, just 100 grams of beef liver (think of a deck of cards as the serving size) has around 53,000 IUs of retinol. So how much liver should you be eating, then? One in four U.S. adults is deficient in vitamin B12. And most of the rest are only getting a barely sufficient dose. Vitamin B12 is essential for energy production, blood formation, DNA synthesis and myelin formation. Myelin is insulation that protects your nerve endings and allows them to communicate with one another. B12 is not readily available in plants. So if you don’t eat meat or animal products, you are at risk of being deficient in this important nutrient. The few plants that do contain B12 are actually B12-analogs. That means they block the uptake of true B12. So, your body’s need for the nutrient actually increases. Another issue with B12 is that you’ll often see B12 supplements in your neighborhood health store. But what they don’t tell you is that these supplements are barely, if at all, absorbed in your digestive system. This is where liver comes in. Just 100 grams of beef liver contains around 60 mcg of vitamin B12. That is 988% of the daily value "needed." Not consuming enough vitamin B12 can lead to a multitude of health issues including, depression, anemia, sleep problems, cardiovascular disease, cancer and fertility issues. Another nutrient packed into liver is CoQ10. CoQ10 is also a powerful antioxidant and immune-booster. It guards against disease-promoting damage to proteins, lipids and DNA. Mitochondria are the "power plants" of your cells. 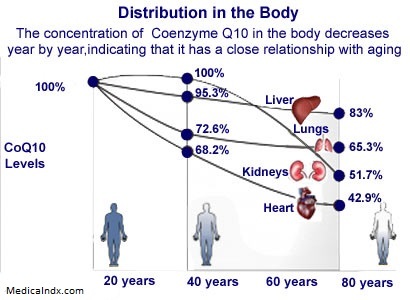 And CoQ10 is one of the most important nutrients when it comes to keeping those mitochondria healthy. And you need to keep them healthy. That’s because there’s a strong connection between defects in mitochondria and resulting oxidative stress in the brain. In other words, a CoQ10 deficiency produces disruptions that can lead to catastrophic consequences. It contributes to many age-related neurodegenerative conditions such as Parkinson’s and Alzheimer’s. CoQ10 levels in the brain begin declining at the age of 20, and sharply decline after the age of 35. There are different forms of CoQ10 supplements. But nothing beats getting this nutrient from whole foods. Vitamin A is a fat-soluble nutrient, meaning it’s stored in the body for long periods of time. That’s quite different from water-soluble vitamins that are quickly excreted by the body. This means there are risks of toxicity. And because there is so much vitamin A in liver, you don’t want to overdo it. From all I’ve researched, eating about a quarter-pound of liver once a week is all you need to receive sufficient amounts of vitamin A and still benefit from all the other nutrients within it. To those who have tried liver, you’ll agree that it is quite the acquired taste. But it isn’t the worst thing in the world. Many diners and delis serve liver. If you’re feeling adventurous, you can try pan-sautéing it at home with some salt and pepper, or you can find many great recipes online. We would love to hear your own experiences with liver and any recipes you may have. Leave us a comment in the section below. After you look at some radioactivity data for liver, you may change you tune. Radioactivity concentrates in organ meats, brain, nerve tissue, and pink slime. Google radioactive fish photos from bikini tests, if they are still available. You may get some graphics worth more than a thousand. Brad, does someone pay you to write this tripe? Evidently. . .
Any chance the many questions posted will be answered? You owe it to your readers to mention that liver contains very high levels of purine. This causes high levels of uric acid to develop in the blood. And then we develop kidney stones and even gout. So that’s the negative! And I (used to) love liver. And so do my kitties. What about chicken livers? These are popular in the south cooked with onions and bacon. Go easy on bizarre food recommendations, regardless of scientific nutrient content. Americans do not eat for nutrients, they are too self-centered in the short-run. They believe doctors are always standing by to fix whatever ails you. 70s when calves liver was readily available in my farming area …even fed it to my sons, lying to them it was chicken fried steak). But now, with deceit permeating our society, my confidence in the content of anything is low. Slaughterhouses? Please. Liver and onions cooked and then covered with sour cream-yum! Liver is the detoxifying organ . I agree with Andre. But if the liver comes from “organic sources”,then that’s ok . ? Is how & where to get these relatively ” safe ” livers? Regarding the comment on toxins, etc. That is why when consuming liver, or any organ meat, it is important to use grass fed meat. Actually, all meat consumed should be grass fed. we ate liver regularly at home all our lives, and still do. agree saoking in milk, and use whatever spice , serve with mash potaytoes. For those that don’t like that taste of beef (or chicken) liver, there is another way. Yes, its not fresh, and is processed with spices and additives, but liverwurst spread does not have the same strong taste. A food way to get essential B12 instead of a pill. One other recommendation I have for anyone adventurous enough to cook liver at home is to let it soak/marinate in milk for about 20 minutes before cooking it, especially if using a high-heat method like sauteing. This will help to neutralize the strong iron flavor prevalent in liver, which is the biggest reason most people reject it. After soaking/marinating, then prepare as you normally would. Just wondering if Chicken Liver has the same benefits ….. that’s pretty much a staple in our house ! And it was growing up, also !!! cook up sliced bacon, add chopped onion, then chopped apples, THEN diced liver, just sauteed. Yum! For me, liver is delicious just sauteed in olive oil with salt and pepper! Onions add another excellent dimension!, and poultry seasoning, too! Do you get the same nutritional benefits from poultry liver – chicken, turkey, duck (pate’)? My mother cooked liver at least monthly when I was growing up. I love it. Pour boiling water over the liver prior to cooking. Let it sit for 5 mins, wipe dry, flour the surface, and sauté in oil/butter/margarine as normal with salt and pepper. Don’t overcook it. It will not be tough. Serve with carmalized onions. Originally, I found it hard to eat liver when my Mom cooked it, However, a friend showed me how to smother it with onions & peppers in a frying pan to make it pleasant to eat. In our family eating liver was a regular meal. At least once per week. There are a myriad of ways to prepare and eat it, from just liver to liver and onions and even putting it into a soup made from nothing but garden produce. Let your imagination run and enjoy! Be careful there Cowboy…..You only gave us half the story. Liver does in fact cleanse the blood of toxins and poisons. With what they feed cattle today with antibiotics, cement, and growth hormones and a host of other items, all of this ends up in a concentrated form in the liver. So with that cocktail of Vitamins and Minerals that you get from eating the liver you also get all the toxins and who knows whatever the cattle association and feed lots give these wonderful animals today. Good luck with that Cowboy….you are on your own with this one. Does eating chicken liver offer the same nutrients as beef liver? Liver fried with seasoning and ample diced onions is easy, quick and yummy. Thanks for the article on liver. However, fresh beef/calves liver is not sold in my local supermarket. The frozen liver they do have does not taste very good. Omaha Steaks has frozen liver but it is very expensive. Any thoughts on where to get fresh calves liver ? Your article doesn’t specify, but is there a difference between beef and chicken livers, nutritionally speaking? I enjoy both. Read your articles frequently, and thoroughly enjoy them. This article on liver, may be true, one important concern though. The liver is a filter for the blood, it removes toxins. With all the growth hormones, antibiotics and whatever else gets into animals today, I’ll pass on injesting anything that has been subjected to these drugs, pesticides or other “products” that supposedly are “safe”. We simply do not know what the long term consequences are from consuming such products, although I’m sure we can well speculate. I’ll stay with a primarily organic plant based diet, and eat a wide variety, as much as I’d like. I grew up on liver & I especially love chicken livers–they are more tender than beef liver. I sautee them with onions in some butter until the onion is carmelized and the liver is browned. I toast a slice of wheat bread and put the livers on top. Wala!!! One of my favorite dishes. Sadly, my husband hates liver of any kind & doesn’t appreciate how they fill the house with their aroma so I seldom make them anymore. I don’t have any recipe’s for you. Just wanted to let you know how blown away I was by your article on liver. . . I have been low on iron for some time and sometimes am turned away from donating my blood to Red Cross due to lower iron levels than their standard even though I double up on iron pills. Your article was a real “eye opener” for me and what a “power house” beef liver can be.